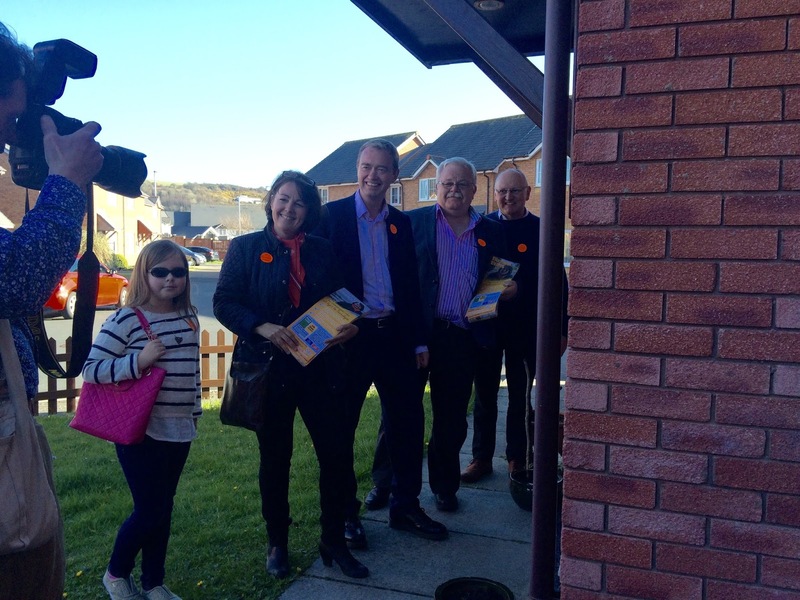 Catryn joined myself and the team canvassing on a sunny night in Aberystwyth and I was interviewed by her on a range of important issues. Here is the interview, hot off the press. Catryn: We need clearer labelling on packages about recycling - there is lots of wrapping that can’t be recycled. Elizabeth: Well you are right, its better to have more recycling and less packaging. We know that there are lots of things like apples and oranges that don't really need to be all wrapped up, but the supermarkets sell them with lots of packaging which then needs to be thrown away. We should look at how we can make it easier to get the weekly shop without so much packaging. Like you say, we should all recycle as much as we can and it’s very important to do so. Catryn: There should be proper cycling lessons for children because lots of children can’t cycle well. 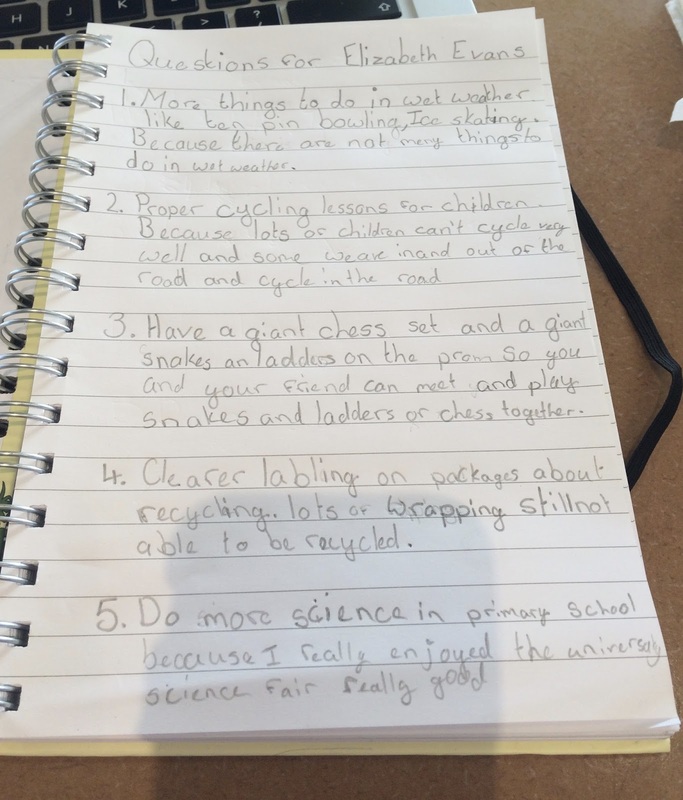 Elizabeth: There should definitely be cycling lessons available for all children. There ought to be money available for this if there isn't already - I will need to check on this for you. I think all children should have cycling lessons because its important for us to be healthy and cycling is a good way to keep fit, but it is also important that everyone is safe on their bikes; especially if they are cycling on the road. You could start a petition about this if the services aren't there to ensure that children can learn to ride their bikes safely. Catryn: We should have a giant chess set and a giant snakes and ladders set on the Prom so that you and your friend can meet and play together. Elizabeth: Great idea! I will contact the people responsible for the services on the Promenade and ask them if they can look into this idea. It would be great for local people and it would also encourage tourists to use the Prom whilst they are on their holidays. That’s something I would love to do too - although I’m not very good at chess- my husband Graeme loves playing it. 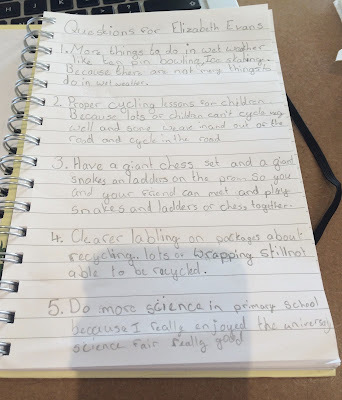 Catryn: There should be more science in primary school because the university science fair is really good. Elizabeth: It’s great that you love science! I have heard that the university science fair is very good too and it’s fantastic that they encourage youngsters onto the campus. I am a school governor so this is certainly something I can ask teachers about and see if it is possible to teach more science at primary school level. What you learn in primary school is a really important grounding for going into secondary school and studying further, so we should encourage young people to study science - the earlier the better! Catryn: more things to do in the wet weather like ten-pin bowling or ice skating because there are not many things to do in in the wet weather. Elizabeth: Yes; I agree with you Catryn. We need more things for young people and visitors to do in the wet weather. There used to be a ten pin bowling alley in Llanbadarn but that closed. There is a gap in the market here for something similar like laser quest as you say. This is certainly something that we should try to attract to Aberystwyth. Catryn: What do you think about kids voting? Elizabeth: I think it’s a great idea and we should certainly try to make that happen for the next election! I went to see pupils in Penglais school last week who asked the same question - they are much older than you but just a little bit too young to vote; which is very frustrating for them. So, yes, indeed young people should be able to vote and we should seriously look at reducing the voting age to 16.